This is a "kit" or grouping of products that consists of our most popular products for women experiencing hormone imbalance. 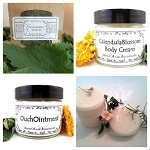 ProMeno Women's Wild Yam Cream, Vital "V" Wild Yam Salve, Lover'sLube and BreastBalm are our herbal "pots of joy" that will nourish your body and mind! A sample of MegaMineral Blend for infusion is also included. This "kit" saves you $20 or 15%!!! I have been a client for over 20 years, moonmaids products have always worked for me. I highly recommend trying their products. You will not be disappointed! Used cream for two months always have been looking for a wild yam cream like I got from Australia that's pure wild yam. This cream has a nice consistancy and. Like the faint scent. Will continue using this and happy to find something in united states.